Please note: Due to manufacturer's restrictions, Maui Jim products can only be shipped to U.S. customers. Maui Jim Makaha-905 Prescription Sunglasses follow a long tradition of comfort, with prescription lenses providing the maximum protection. Maui Jim Makaha-905 Prescription Sunglasses are well known for classic quality, comfort, and durability in prescription sunglasses. 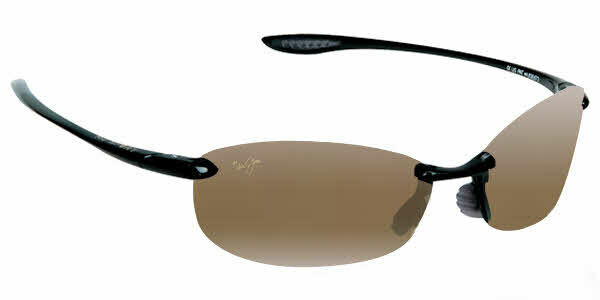 Maui Jim Rx sunglass frames are crafted of monel, nylon, or acetate and are among the finest sunglasses in the world. Rugged Maui Jim prescription sunglasses feature light-weight frame materials blended with Maui Jim's patented PolarizedPlus® lenses to produce a durable prescription sunglasses line cool enough for daily wear. Maui Jim was awarded the Seal of Recommendation from the American Skin Cancer Foundation for having the highest amount of UV Protection on the market. MJ Sport logo on tops of temples. Made of grilamid, which is a durable, ultra-lightweight, flexible and hypoallergenic material. Rubber temple tips for comfort and fit. PolarizedPlus2 Lens Technology, which is a color-infused lens technology that reduces glare and boosts color. Lenses made of Maui Polycarbonate (impact-resistant and lightweight) or Maui Evolution (combination of durable glass and Maui Polycarbonate). Single vision and progressive/multifocal vision lenses available. RX range of +3.00 to -3.50. Maui Jim case and cleaning cloth included. MauiPassport treatment to digitally tailor your eye's prescription to the lens and its shape, providing the clearest and widest view possible compared to untreated lenses. Red, green and blue lens treatments to enhance the view with color. Gradient mirror or tint treatments to eliminate overhead and reflected glare, allowing light through. Polarized film to eliminate 99.9% of glare from flat, smooth or shiny surfaces, making it possible to see below the water's surface. Anti-reflective treatments to block reflected light and glare from behind, providing a clear view. Waterproof and oleophobic coating to shed water and repel grease, making them easier to wipe away. Two scratch-resistant coatings added before and after the water-resistant coating. See also: Maui Jim Sunglasses, Maui Jim Collegiate Sunglasses & Maui Jim Readers Sunglasses. After having my non-prescription pair of Maui Jims for the past 12 years and still holding up, I decided to bite the bullet and get some prescription Maui Jim Makahas. These are the same great quality I've come to expect and the prescription lenses are true. All around seems like well worth the cost. This was my second pair of Maui Jim Prescription Sunglasses. I loved my first pair so I ordered another one with my new prescription. While the frame didn't change. the size of the lens got smaller which was disappointing. It is not a deal breaker but had it been the same size as before, it would have been another perfect pair. Overall, FramesDirect.com provided a good service and the sunglasses are 85% satisfying. This is the second pair of Maui Jims I have purchased. I need prescription sunglasses, and these are definitely sturdy but lightweight. They also have a guarantee, so Maui Jim will repair at no cost. I had another pair before this, and due to my own not putting them away in case, have broken them several times. After a number of years, I finally decided to purchase a new frame to go with my new prescription. I am extremely happy with them, with the quality of the lenses, and the workmanship. They are perfect! The quick turn-around time for the order was pleasantly surprising. The quality of the lense is the same as the non-prescription ones. So glad I made the purchase!